Throw your mistempered weapons to the ground, / And hear the sentence of your movèd prince. Tonight you should read the first four pages of Act I, scene i, of Romeo and Juliet, (lines 1- 105). Please be sure to check out the verso (the left side of the page) for the summary of the scene and extra information about specific words, as you read. Also, be sure to ANNOTATE, but keep it useful for you as we discussed in class. Be sure to note special parts of the text that you found interesting, unusual, or surprising; please also keep a list of questions you would like to bring up with the class. How does the fight start? develop? conclude? What does this tell us about the overall conflict? How does this part of scene i establish the setting for the play? What predictions or theories do you have based on the events so far? How was reading the play different from the movie version we saw together? How did seeing the movie version first change your understanding of the text? Posted on March 1, 2018 by equinson	• This entry was posted in Romeo and Juliet. Bookmark the permalink. After reading scene i of Romeo and Juliet it is adamant that it is not, by any means, an easy read. The language is much different and there are some slang terms that you can get the meaning of on the left side of the page. From reading, we learn the two families, or houses, that are fighting are the Capulets and the Montague. In this scene we see a fight break out. At first, we read about a man named Gregory and a man named Sampson talking who are in the Capulet house. They are talking about the fight and how they will not back down. Just as they are talking two men from the Montague house walk by. “Gregory …Dry thy tool. Here comes of the house of Montagues. (lines 32-33)” Then as they are passing Sampson says “I will bite my thumb at them, which is a disgrace to them f they bear it. [He bites his thumb](lines 42-44)” To the Montagues biting your thumb at someone is considered very rude. This is how the fight breaks out. A couple of people around join. Then Old Capulet and his wife enter. He says “What noise is this? Give me my long sword, ho! (line 76)” Than him and Montague talk and Montague says “Thou villain Capulet!- Hold me not; let me go.” Then Prince Escalus enters and tells the people if they do not stop fighting they will have to pay a fine for disturbing the peace. This tells us that conflict is everywhere because people are either side. I think the fights may get very severe and that is why Romeo and Juliet will kill themselves. They didn’t want more people to die. Good job Abby! I really understood what happened here. Your concept about Romeo and Juliet dying is very interesting. I’m excited to find out! After reading lines 1-105, many events take place such as a fight between two homes. Two servants, Sampson and Gregory are two servants from the house of Capulet. They both talk about their hatred for the Montague house and how they think of the pleasure of defeating the Montague men. Then, they see two Montague servants and try to think of the best way to provoke them without getting in trouble from the law. Sampson bites his thumb, which in Verona during that time period, was a act of defiance and an insult. After this, a fight begins to arise between the four men. At this time, Benvolio a relative from the house of Montague has a sword in his hand, trying to prevent the fight from escalating and trying to keep the peace. Tybalt, a relative from the house of Capulet sees Benvolio’s sword out and rushes outside. Benvolio tries to explain that he only has his sword out to prevent the fight. However, Tybalt says, “What, drawn and talk of peace? I hate the word. As I hate hell, all Montagues and thee. Have at thee, coward! (Lines 71-73) They all begin to fight each other. Other citizens from the same town see the commotion and start beating their clubs to encourage the fight. Then old Montague and Capulet enter, and have this very angry and vicious vibe. Finally, Prince Escalus enters and commands everyone to stop and if anyone dares to continue they would have torture as their punishment. He also says that the anguish and rivalry between the two families have gone on long enough and if anyone dares to disturb the peace again will die. We see here that this fight has been going on for two generations. I predict that Romeo and Juliet come from either two families. Also, I think that Shakepeare started the play with the fight between the two families because it shows how much hatred they have for each other. Also, its really interesting because when Shakespeare wrote the first part of the first scene, I could vividly imagine this happening in a play. In addition, in the prologue, it says they come from the same social class, so the fact that they start a street brawl shows how much they stooped down below their level. Also, Prince Escalus says that if there is ever such a fight like this again, people will die. I predict that the next time the families fight will be when Romeo and Juliet profess their love for each other and tell their families. I am excited to read what happens next. Great job Anjali! It seems like you understood the text well and I like how you ended with a future prediction. After a challenging first night of Romeo and Juliet by William Shakespeare, many things have occurred so far. First, we open upon Sampson and Gregory, two Capulet servants who are having a conversation. Sampson discusses how he does not want to be humiliated. Soon Sampson’s bravery comes into question, and Gregory thinks he is a coward. Sampson points out that he is brave, and they talk about maidens and what they would do with them if they encounter Mountague women. Sampson comes up with an interesting idea, saying “‘Tis all one. I will show myself a tyrant…I will be civil/ with the maids; I will cut off their heads.” (ll. 22-24). Soon, Abram, a Montague arrives and the Capulets prepare for battle. However, it does not get this far, and Sampson just gives Abram an obscene gesture, by biting his thumb. They both start questioning each other, and it becomes clear that neither side wants to start a fight. The situation soon escalates up to the point where each men draw their swords, and they fight. 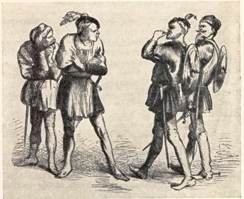 A new character named Tybalt emerges, and after Benvolio (a Montague) draws his sword to break up the fight, Tybalt taunts him. Benvolio tries to reason with him, saying he’s trying to keep the peace for everyone’s sake, but Tybalt wants to hear none of it as he sees his sword drawn. The townspeople happen upon the encounter unfolding and join the fight, along with an old Capulet and an old Montague, each with their wives. Both want to get in on he action, but Prince Escalus comes to break up the fight. He addresses both Capulets and Montagues, and then orders everyone to leave, until only the old Montague couple and Benvolio are left. They talk of Romeo, and Benvolio tells them he saw the young man when he went for a walk in the morning. He walked towards Romeo, who tried to hide and ignored him. Montague comments that he has noticed that Romeo has been depressed recently, and when inquiring about the cause of this sadness, Montague replies he could find no reason. I found tonight’s reading to be a very interesting way to open the play. The fight between the Montagues and Capulets in the first scene reveals to me the immediate conflict between the two families. Shakespeare wastes no time in showing how much each hates the other. This fight further reveals Verona as the battleground which both houses wage war on. Each tries to destroy the other one, yet from what has been read so far, it seems as if the fight stays in the town. Romeo also seemed intriguing. Him being depressed makes me wonder if he has found his love for Juliet yet. To me, this begs the question, over how long of a time period does this story take place? Does it develop over the course of months, or instead weeks? Going into the rest of the play, I hope to see more interesting details such as these and hope my questions are answered. Great job, Matt. Some of your points were different from what I thought, and they really opened my eyes to a different point of view. Fantastic Job, Matt! You explaining absolutely everything in great detail. Your response also featured great analysis and evidence. Keep up the great work! In the first four pages of Act I of Romeo and Juliet, we are allowed a first look of how the play is written and what it’s like. In the beginning, two men of the house of Capulet are conversing. As two others from the house of Montague enter, they bite their thumb as a gesture of defiance towards them. This eventually leads to violence, when after Benvolio arrives, they draw their swords. From this, I can infer how volatile the ever present tension between the two households is. Over such a small frame of time and exchange of words, a fight breaks out between them. Next, a man named Tybalt enters, who argues with Benvolio. Benvolio attempts to persuade Tybalt to resume peace, but he still fights and spurs the battle even more. Followed by this three or four others join the clash, on either side. This makes me realize that not everyone has no thoughts but to kill their enemies. There are some who actually try to create peace, instead of violence. Then, old Capulet and his wife arrive, as well as old Montague with his. These two leaders of their families argue further, when finally Prince Escalus enters the scene. The prince, from an unknown group, makes a long speech, in which he endeavors to put some sense into the two neighbors. He states, “Profaners of this neighbor-stained steel… You men, you beasts / That quench the the fire of your pernicious rage… “ As the book defines, he is reprimanding them all for putting their weapons to degrading use, by shedding their neighbors’ blood. This furthers my previous point, that some people desire peace between foes. They try to convince each other to stop fighting. After reading these lines, a question I have is: What caused these two families to hate each other so much? The only context we are allowed is that they have been enemies from ancient times. I wonder what it was, and I hope to find out later in the book. The first scene of this book sets the setting for the whole play. We learn about the conflict of the two families, and Romeo’s love. The scene starts with the servants of the Capulet family, Sampson and Gregory. When the servants from the Montague’s enter, a conflict starts. “Draw thy tool! Here comes of the house of Montagues.” Through the fight between the servants, we learn about the conflict between the two families. It gives us a base for the conflict of the two families. The conflict continues to elevates, including the Montague and Capulet themselves, and the kinsmen. The conflict finally ends to Prince Escalus’s words. Prince Escalus gives us more of the background of the hatred between the two families. Their quiet town is filled with quarrel because of the two families. Prince Escalus also states that their continuous arguments will result in a punishment, but they are let go for now. The Prince seems very angry, all he wants is peace in his quiet town. I love how Shakespeare started with the conflict between the two families. It kind of shows when their hatred started. It started from the very beginning. From the start, the two families completely despised each other. From the start of the play, the two families completely despised each other. But why? Next, we get background on Romeo. We learn that he is depressed, and it’s all because of love. I am slightly confused. Is he depressed because he cannot find love? Or is he depressed because he knows he can’t be with Juliet? It is not that clear to me if Romeo is in love with Juliet yet. If he is, Shakespeare was awfully fast in getting the love between them started. Act one, scene one of Romeo and Juliet by William Shakespeare was very eventful and important. First and foremost, Sampson and Gregory, two Capulet servants had a conversation, discussing how Sampson does not want to be humiliated. They proceed to discuss Sampson’s bravery, where Gregory believes he a coward. Sampson defends that he is not a coward and he’s brave points out that he is in indeed brave. Sampson goes on to explain what he would do if he saw any Montague women,“‘Tis all one. I will show myself a tyrant…I will be civil/ with the maids; I will cut off their heads.” (ll. 22-24). After that, Abram, a Montague, arrives and the Capulets prepare for battle. Sampson responds by biting his thumb, “I will bite my thumb at them, which is a disgrace to them f they bear it.(ll. 42-44) This action of biting your thumb was seen as very rude and disgraceful in Verona during this time period. Tensions rise, and soon the men draw their swords, and they begin to fight. Benvolio, a Montague, draws his sword to break up the fight, and maintain peace. Benvolio tries to compromise to avoid a battle to Tybalt (Capulet), who had taunted him. However, this does not work, and the fighting officially begins. During the fight, townspeople join in, to make this a massive brawl. Finally, Prince Escalus enters and demands that the fight is over at once. He demands that Capulets and Montagues leave, as well as everyone else, ending the fight. This fight between the Capulets and the Montagues portrayed that conflict that these families had. I believe that this is just the first of many incidents between these two groups that will happen within the course of this novel. In addition, I wonder when Romeo and Juliet will officially fall in love and how that will impact the feud. I hope to see what unfolds in the next reading of Romeo and Juliet. Today we read the first couple of pages in Romeo and Juliet by Shakespeare. The part that interested me was when Prince Escalus came to stop the fighting between the two families. He said, “Three civil brawls bred of an airy word/ By thee, old Capulet, and Montague,/ Have thrice disturbed the quiet of our streets/ and made Verona’s ancient citizens/ cast by their grave-beseeming ornaments/ to wield old partisans in hand as old/ cankered with peace, to part your cankered hate.”(lines 92-97) The Prince is saying that the physical fights have happened between the two families not only once, but three times. The prince also mentions that the citizens of Verona know well about the ancient grudge between the two houses, and they hate it. The citizens want the Capulets and Montagues to stop fighting so that everyone could be at peace. The people are tired of rushing to stop the outbreaks of fighting between the families. This is shown when the citizens first came upon the brawl with weapons. “Clubs, bills, and partisans! Strike! Beat them down! Down with the Capulets! Down with the Montagues!”(lines 74-75) Their yells show that they want to stop the two households from fighting, wreaking havoc, and disturbing the peace. It seems as if the two families are the only ones that are fighting in their area since the Prince himself found them as such an issue. Or it could be the fact that even though others fight, they do so verbally and without the drawing of swords or blood. I wonder if the Prince or citizen know what the event was that caused the two families to hate each other. We certainly don’t know yet, but I hope we will find out soon. Great job! Your blog showed a beautiful understanding of what the Prince said and what you interpreted from it. Keep up the great work! Great job Arina. I love how you focused on one aspect of the reading and really analyzed it. Great job! After reading act 1, scene i of Romeo and Juliet by WIlliam Shakespeare I was a bit confused but as I looked at each bit by itself and then pieced them together, I started to understand the text more. There were these two (motif of two) servants, Sampson and Gregory from the house of Capulet, who were talking smack about the Montague, the other house. Sampson was talking about how he wants to fight people from the house of Montague and was saying how he can’t be their little puppets. Sampson says, “Gregory, on my word, we’ll not carry coals.” My interpretation of this was that they won’t let Montague humiliate them and they won’t take out their trash. To me this sounds like little kids getting mad at their older siblings and saying that they won’t be their little side slave and yet the older kids are feeding off of their anger. When the Montague arrive, they seem pretty bothered. To make the people from the house of Montague more annoyed, Sampson bites his thumb which is a sign of disrespect. This sound like a little sibling doing the smallest thing that would get the older sibling annoyed and start a fight. Next, Abram says, “Are you biting your thumb at us?” This is like the part where the older siblings say, “are you kidding me?” Sampson then asks Gregory if he can say yes or its not allowed under their Prince’s laws. Gregory says no. This reminds me of when a sibling asks another sibling if their mom will get mad if the do something and the sibling replies yes, don’t do it because then we’ll be the ones to blame. The members of the Montague house start to take out their swords and so does Sampson. This is like the two sides getting ready to make “civil hands unclean”. Finally the Prince comes out, and like a parent, he gets mad and says, “And hear the sentence of your moved prince”. When I read this I thought about how the Prince is like the parent and is saying how if they won’t stop bickering, they will get punished. I kept thinking about this and then I realized that maybe Shakespeare was saying how their fighting was like a kid’s fight, unreasonable and just like siblings, deep down they can feel love towards each other. Moving forward, I think it’s important to keep in mind the fighting being like a sibling fight were its not a big deal but they make it a huge deal. The Capulets and the Montagues get into a bloody and severe fight in the first pages of Romeo and Juliett. Two people from the Capulet household, George and Sampson, are talking. When they realize that some people from the Montague household are walking by, they decide to disrespect them. They bite their thumb at them, which is a sign of disgrace to the Montagues. The two Montagues see this, and approach the Capulets. After Abram, a Montague, confronts George and Sampson, the two groups start to fight. As the conflict progresses, more people from both households join into the fight, supporting their respective families. After a while, the two older Capulets come outside to find out what is happening. They are approached by two older Montagues, and those two grous share words. Finally, the Prince enters and puts an end to this fight. He tells the people from the two families that if they do not stop their fighting and disturb the quiet city ever again, they will pay with the deaths of a person from each of their households. He then sends everybody away except for the two old Capulets and Montagues, who he will talk to more to ensure that the conflict will stop. In tonight’s reading, right off the bat we saw Romeo and Juliet’s families fighting one another. This wasn’t just an argument, this was a literal brawl with swords and all! What happened was two men, Sampson and Gregory who are Capulets are talking about how they don’t want to be looked down upon or humiliated in town, so they must fight the Montagues. However, Gregory knows well that Sampson doesn’t stand a chance, “To move is to stir, and to be valiant is to stand. Therefore if thou art moved thou runn’st away.” Of course here come the Montagues who immediately start picking a fight, knowing they are stronger than the Capulets. One thing led to another, and they had a huge fight in the middle of town, “CITIZENS: Clubs, bills, and partisans! Strike! Beat them down! Down with the Capulets! Down with the Montagues!” We see that they truly can’t stand each other, they both think they are better than the other. Once the swords were brought out, I realized the setting of this play wasn’t just going to be a little rivalry, this is gonna be like a civil war between two families who are so similar. I obviously know what happens with Romeo and Juliet, but seeing the true hatred makes me understand their reasoning a bit more. Their love was truly forbidden, and they were saying no to all this stupid fighting, they were saying yes to love no matter what. This sort of reminds me of present times, where people fight to be with the people they love. Whether it is forbidden because of their partners race or gender, people will now fight for love, because love is love. That is the mindset of Romeo and Juliet, love is love. I also loved what the prince said in his monologue at the end. “By thee, old Capulet, and Montague, have thrice disturbed the quiet of our streets and made Verona’s ancient citizens cast by their grave-beseeming ornaments, to wield old partisans in hands as old, cankered with peace, to part your cankered hate. If ever you disturb our streets again, your lives shall pay the forfeit of the peace.” He said listen, this behavior is unacceptable, you are disrupting the town and no one wants to hear the constant bickering, and it would be for your own good to come to peace! I enjoyed reading act I scene i, and I am excited to keep reading. I agree with you completely, especially when you said how the families are competing for nobility, and the citizens are rooting for one or the other. I also really liked how you mentioned that Romeo and Juliet are prime of examples of anti-war, and believers in love just being love. Your analysis was very good, however, I think you contradicted your own points. First, you said that the Capulets and Montagues fought a lot with each other and then the quote says to take down both people. The fight starts with two men who are of the house of Capulet, Sampson and Gregory, who are on their way to do duel with men of the Montagues. Sampson and Gregory discuss how they will take a stand to the duelers. Sampson even states that “A dog of that house would strike me to stand.” Even a dog of the Montagues is considered an enemy. Abram and some other serving-man. Upon seeing men from the Montagues’ home, Sampson “bites his thumb,” which is a sign of defiance. Benvolio of the Montagues and Tybalt of the Capulet’s, and then there is a sword fight in the streets of Verona. Capulet enters and directs his wife to hand him his sword to participate. Montague and Lady Montague appear, and Montague is ready to fight, but his wife is holding him back. “Thou shalt not stir one foot to seek a foe.” She tries to convince him that it isn’t worth it trying to go fight the Capulets, because they know better than to fight. The fight ends when the Prince of Verona, Escalus, appears and threatens to the fighters and the families that if this disruptive fights continue, then they will be executed. Clearly these families fight any time they can, and it seems that the fights have been going on for forever. Something tells me that a larger fight will occur soon. Shakespeare has presented a conflict between the families, and the fight was just a scratch up in the street. This conflict may continue privately, with threatening letters, or poisoned food. The prince’s threat may stop the families from fighting publicly, but under the surface they seem to be boiling with anger. When Romeo and Juliet meet, I think that it’ll make the parents insane. My main question is, why are these two families in a grudge. Whatever happened to start it. If this problem started from a pass generation, then why are these families still foes. This was a great response with a lot of strong detail, great job! I’m going to be honest, I had a hard time reading this and will most likely have a better understanding of this scene by tomorrow in class. But, I went through and reread and hopefully with the help of the summaries, I think that I have gotten a good understanding of what it is about and the message that Shakespeare is trying to get across. In this scene, there is a fight going on. It takes place at the Capulet residence with their servingmen talking about hurting the Montague’s. Right away from this line, we can see that the rivalry goes so deep that even people that aren’t apart of the family but rather working for them, are involved in the hatred between the two groups. This entire passage was very interesting because we go straight into the fighting of the two families and not much about Romeo or Juliet. This could lead us to believe that this storyline is supposed to take place before them or at least before they met each other and began to fall in love with each other. If I’m correct with this, then I think that Shakespeare did this on purpose in order to clearly convey to us that this families really do not like each other and that is why we go straight into learning about the fighting. I think that it will obviously be very important for us to keep the word fighting in our minds as a motif because we know for sure that this is not the only time it will be mentioned seeing as it was already mentioned in the prologue as well. Shakespeare could have easily began this play with Romeo and Juliet to show us how much they love each other. But as one of the most amazing writers in all of history, he is going to set us up more than that. What we learn now will be important for helping us to understand what will go on throughout the rest of the play. In tonight’s reading, we see the scene opening with two servants of the Montague and Capulet households.They converse, each essentially taunting each other, before people of higher and higher status enter the scene, until Montague and Capulet enter the scenes themselves, beginning to fight. They are interrupted, however, by the prince of Verona. He shames them for once again fighting, for this is the third time this has happened in public. There was a particular line that caught my eye, bringing a conundrum to mind. “If you ever disturb our streets again, your lives shall pay the forfeit of the peace”(Line 99, Act i) This seems to be foreshadowing of the later events of the story, as he is threatening them, that if they cause another disturbance/fight that they would pay the price due. Yet it’s not Montague or Capulet who pay the price of this conflict but is rather Romeo and Juliet, in taking their own lives. My theory is that there is still a toll on the lives of Montague and Capulet, as their children both took their lives because of their problems. This is an extremely heavy toll, and most would rather take their own lives than endure this pain. First of all, I would just like to say: it was extremely hard to understand what happened. However, after rereading multiple times, I might know what happened. I think that we should spend some time tomorrow going over the part of act 1 that we read. There are two Capulet servants who hate the Montagues, Sampson and Gregory. They don’t want to “start” the fight because the prince clearly said that he did not want any fighting. To make the Montagues fight, Sampson pretty much bites his thumb at him and starts the fight. Eventually, they are all brawling with each other with weapons. “Citizens: Clubs, bills, and partisans! Strike! Beat them down! Down with the Capulets! Down with the Montagues!”What is strange is the Capulets are servants and the Montagues are rich, but the prologue says they are of the same class. How is this possible? Does something change later on? Now rereading the quote, I am even more confused? Are the Capulets rich like the Montagues, or are they servants? If it is the second, what is going on? During their fight, the prince arrives and gives a long speech about how he will get them all killed if they continue to fight. “If you ever disturb our streets again, your lives shall pay the forfeit of the peace.” Obviously, as the prologue previously mentions, the rivalry still continues so the prince’s words do not really have any meaning to these people. I was also confused when I first read this. To answer your questions the Capulets aren’t servants. Sampson and Gregory are the servants of the Capulets. The members of the Capulet family are high class. Overall, you had a nice blog and like how you were unafraid to ask questions on what was confusing you. In the first four pages of scene I, a lot has already happened. Gregory and Sampson from the House of Capulet were talking until they crossed paths with Abram, a servingman for the House of Montagues. In response, the men drew their swords, which made the situation tense. Benvolio, the nephew of Old Montague, then enters the scene to see what was happening. Sampson challenges him to a fight, and Benvolio accepted, drawing his sword. Suddenly, Tybalt from the house of Capulet comes into the scene to defend his comrades. Benvolio tried to make peace, but his sword was still drawn and the attempt failed. They started to fight, and some citizens were drawn to the commotion and were trying to take them all down. It didn’t take long before the two foes, Old Montague and Capulet, to enter the scene. As you can see, the problem has escalated quickly. It was not until Prince Escalus intervened did the conflict end. You can tell that the two families were in a very bad relationship, and as well with the town. The response the townspeople gave was to strike them down. It is my best guess that the two families cause a lot of trouble if the prince had to intervene. It was only a few pages into the story and we were already shown a lot of drama. I wonder what awaits us in the following scenes. Tonight we began Act 1. We read from lines1 through 105 and the text was quite challenging. It took me many reads to have even the slightest grasp on what was being said and the left side didn’t help me much, but after reading a lot of the blogs I think I have a much better hold on tonight’s portion on the text. Essentially what occurs is a brutal street fight between the Capulets and the Montauges. It all starts with two servants of the Capulet house- Sampson and Gregory. Sampson is describing what he’d do in a fight with the Montauges, and how he’d fight them to the wall and cut off the heads of their maids. How he’d be brutal with the men and civil with their ladies. But Gregory however chooses to call Sampson out on his bluff. He doesn’t believ Sampson has the gumption to get up and fight if the opportunity presented itself. Then some servants of the Montauges enter and the four quarrel until Benvolio enters and draws his sword in attempt to diffuse the brewing conflict. Tybalt of the Capulets sees this and accuses Benvolio of being a coward. So soon they all begin to fight and then civilians with clubs and weapons egg them on and join in. Also the heads of the Capulet and Montauges houses and their wives exchange very vicious and taunting words at each other. Through their one interaction you can feel their deep seated hatred for one another. Then a prince enters and gives a monologue on how fed the people are. They are tired of the two households constant fighting. He says, “If you ever disturb our streets again, You lives shall pay the forfeit of peace.” He’s saying that everyone is tired of their back and forth arguing, street fighting and if they don’t soon they’ll sacrifice quite a bit. I think this was sort of meant to be a foreshadowing to Romeo and Juliet’s fates. So I’m going to assume that they didn’t end their brawls and fighting and the price was the lives of their children. Well, that successfully set the tone for the play. The language used is technically modern English but we can clearly see differences between Shakespeare’s language and our current English. After deciphering the first 105 lines here is my opinion and summary of what happened and how this sets the setting for the novel. The act began with two men named Sampson and Gregory talking. Sampson seems angry and is eager to fight while Gregory is challenging Sampson’s courage. When a man named Benvolio enters the scene, Sampson challenges him to a fight, just as another man named Tybalt enters the scene and also challenges Benvolio to a fight and then begins to fight Benvolio. At this point citizens center saying “Down with the Capulets! Down with the Montagues!” At this point, Capulet and Montague enter. Capulet tries to access his sword while Montague flourishes his blade. By now, the fighting has escalated to a point where the Prince comes. The prince yells at all of them to stop fighting and mentions that these riots have happened before. These riots clearly showing a dispute between the Capulet family and Montague family. I think that this entrance sets the scene because we now know how much conflict is happening and how the Capulets and Montagues have a lasting grudge. I believe that these are the two households mentioned in the prologue. This scene shows how charged the atmosphere is and the seriousness of the two families grudge. Sampson and Gregory are members of the Couplet household. The Capulet household has been quarrying with the Montague household for a very long time, as we read in the prologue. We begin with Sampson and Gregory are discussing the tension between their families, and that they will not be noticed as the lesser family. At this moment, Abram of the Montague household passes by, and Sampson bites his thumb at Abram. “I will bite my thumb at them, which is a disgrace if they bear it,”(Lines 43-44). This shows that the two households have no respect for each other, and this is where the hostility of our scene begins. Sampson tells Abram that he is a better man, and the two fight it out. Benvolio enters in the midst of their fight, and attempts to keep the tension from rising. However, it doesn’t help when some random citizens run in with clubs ready to fight both families. Then, Montague and Capulet both enter with their wives, and they both ask for their swords to fight each other. They throw insults back in forth at each other, and it takes the wives to prevent them from grabbing at each other’s throats. This whole scene is like when a classroom is doing partner work and everyone just keeps on yelling louder to be heard: the whole scene just gets increasingly chaotic. Finally, Prince Escalus walks in and defuses the situation. He proclaims that if the two families are to disturb the peace again, that they will be fined for doing so. Altogether, this scene is exactly like a classroom in group work. Everyone is yelling and trying to talk over one another, until the teacher comes in and tells everyone to be quiet. When reading this the fight has begun, and Benvolio steps in to calm down the fighting. But Tybalt rallies against him and wants to fight. Finally when the Montagues and the Capulets show up, the only people left are Montague, and Benvolio. They were talking of how Romio was acting unusually and how Montague had no idea how to deal with it. Romio sounded like he was depressed. He came home all he would do is close the windows to make night come early, and it is very sad. In lines 1-105 in Romeo and Juliet by William Shakespeare we get insight on how developed and bad the feud between the Capulets and the Montagues are. It started of with two of the Capulets servants Gregory and Sampson talking to one another about how much they hate Montagues. Then a servant from the Montague family walks by them. Sampson decides to insult him by biting his thumb at him.” Nay as they dare. I will bite my thumb at them,which is disgrace to them if they bear it.” Apparently biting your thumb is one of the worst kind of disrespect in Shakespeare’s time. This is when the conduct starts. One of Montague’s men draws his sword to make sure that no real fight breaks out, but one of the Capulets men take it as a gesture that they want to fight. Soon a whole fights breaks out with even the people of Verona cheering on. This fight gets so bad that even Montague and Capulet joined in. Soon the prince of Verona stops the fight and warns them that Montague and Capulet will be killed if they disrupt the peace. Clearly the prince was sick of all the fighting in this town. The one thing I wonder about is if Capulet and Montague will actually get killed and will this cause Romeo and Juliet to commit suicide. Also I like how the author started off with a fight scene since it really showed the full extent of how bad their relationship is. In the first part of Romeo and Juliet, and thereby the for s 100 lines of Shakespeare we’d ever read,it has become abundantly clear that Shakespeare is a difficult text to follow. It uses a very dated form of English that might even be considered an altogether different language of similar roots. The grammar is difficult, and some terms are impossible without the glossary on the opposite page. But, what I’ve managed to sum up in terms of plot is this: the two households (previously mentioned in the prologue,) are introduced as the Montague and Capulet. The scene opens with two servants of the Montague household are discussing their intense hatred for the Capulet household. When one of the Capulets walks by, one servant bites his thumb at him, which is apparently the approximate equivalent of giving the middle finger. This quickly raised tensions, and, after a small and poorly thought out effort to stop it, a massive fight breaks out. Apparently, the feud of the two households is so popular in town, (probably because of their high wealth and status, judging by their servants), that people begin to join in and take sides. It is only until the prince of Verona himself threatened a fine to each family for disturbing the peace, that the fighting finally stops. No noteworthy casualties occurred, so it doesn’t yet set up a plot as much as it illustrates the hate each family has for each other. As we read the first 105 lines of Romeo and Juliet, we start to get some insight of the conflict between the Montagues and Capulets. It starts when two servants from the Capulet house are talking about how much they hate the Montagues, and one of that very house, Abram, passes by. One of the servants, Sampson, bites his thumb at Abram, which was a very large sign of disrespect in those times. Another from the Capulets, Benvolio, enters, and pulls out his sword to keep the peace between them. When Tybalt, one of the Montagues, sees his sword drawn, he goes down and they all begin to fight .“What, drawn and talk of peace? I hate the word. As I hate hell, all Montagues and thee. Have at thee, coward!” (Lines 71-73) A crowd begins cheering them on, when the heads of the two families come outside and see the fighting. The hatred between them is clear, though we still don’t know where it started or why. Prince Escalus enters with his men and breaks up the crowd, telling them all that if they don’t stop fighting, the penalty will be death. I agree that Shakespeare’s reason for putting this scene in the beginning of the play is to demonstrate the hatred between the families, because I know that it is this hatred which sparks pretty much all of the events in the play. By starting off on this note, it gives the viewer a sense of what is happening in this town, and how deep rooted their grudge is. I wonder what exactly started all of the fighting, and if it was something that old Montague and Capulet did, or if it was something even before that. I predict that there will in fact be another fight, even though there is the ultimatum placed by the prince, and that it will have something to do with Romeo and Juliet this time.